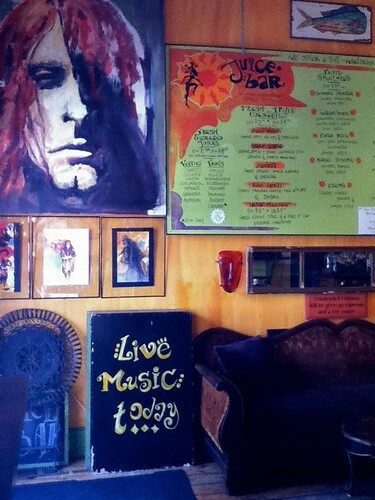 Before Urban Standard, Baked, and Mud, for me there was Tiger Lily Cafe in Port Jefferson. It was a 10 minute drive from Miller Place and it’s safe to say that I spent time there every weekend for over a year. 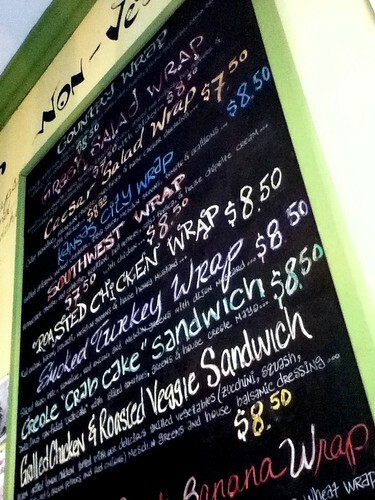 In high school I wasn’t particularly adventurous and never tried their wheatgrass shots or any of their more interesting freshly juiced combinations, but the veg/vegan friendly cafe hooked me on their Provincal and Roma sandwiches (sliced brie, pear, crushed walnuts, mesclun greens and house white wine honey mustard; and fresh mozzarella, Roma tomato, mesclun greens, and basil pesto mayo, respectively). When my mom and stepfather left Miller Place for Williamsburg circa 2003, I found fewer reasons to be down Port. Last weekend, I found myself with some spare time before meeting up with Vinny, so I wound my little car up, around, over and down Belle Terre hill (a half-mile stretch that still haunts my dreams due to the number of laps run during cross country training) and took a seat at the window. It was a strange time between breakfast and the hamburgers I’d planned to have with Vinny, but as I was hungry, I tried my first wheatgrass shot while deciding on a more filling option. 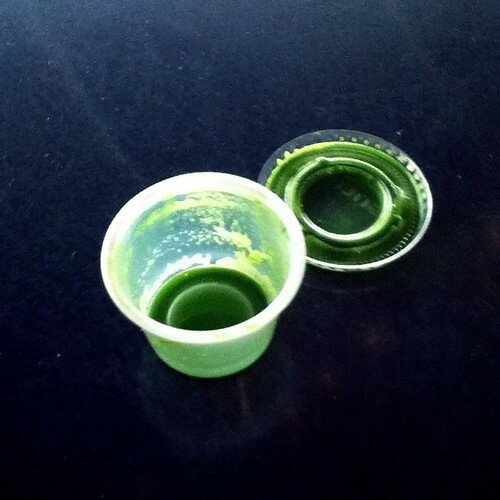 I am glad to now know that I am no fan of the wheatgrass shot. Its ounce of pure, just-mowed-the-lawn, slightly sweet, spicy soupiness (with more than a bit of garlic essence) is too much for my delicate self. It did help me decided to buy some food to help kill the taste. Yeah. 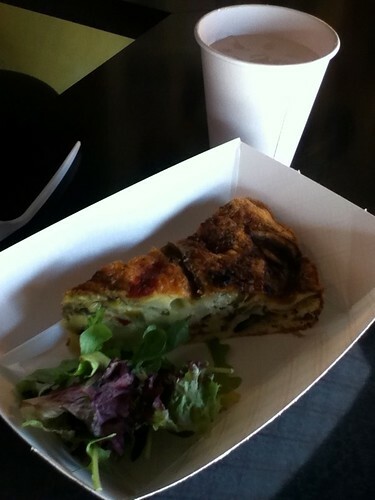 Of the vegetarian and vegan options, I opted for a slice of tender roasted vegetable and cheese frittata. It did the job and held me over until our hedonistic burger fest a few hours later. It felt good walking through Tiger Lily’s door nearly 10 years later and finding that its heart (along with most of the menu) had stayed the same, a bit like a grandparent’s house (without all the fake plastic fruit). 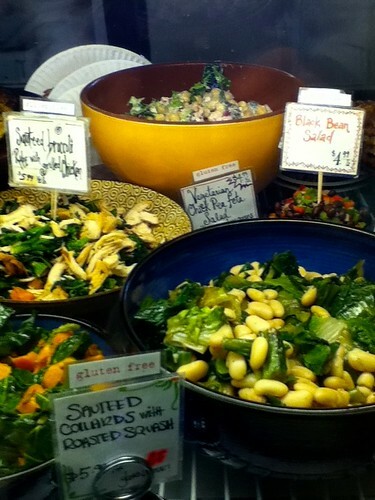 Skip produces The Gourmetro. He dislikes wheatgrass shots about as much as mowing the lawn on a hazy August afternoon. Check out his published works on Aisle 9, and talk with him on Twitter.